Learn NLP from someone known for quality and innovation for over three decades. For an accessible introduction to NLP, you might enjoy reading Heart of the Mind, now also available for Amazon Kindle. 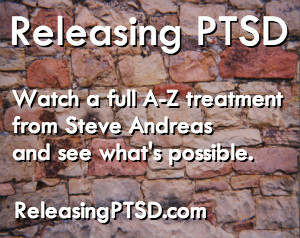 Steve's latest work has been in developing effective methods for the resolution of complex PTSD. 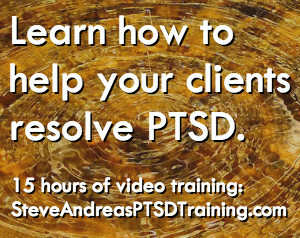 The PTSD Training contains 15 hours of professionally recorded video. In this online video training, you'll learn complete treatment protocols for the phobic response of terror and 15 other methods for all the aspects of complex PTSD. This may very well be the most comprehensive and useful training for resolving PTSD ever developed. Click here to learn more and to watch a sample video. In Releasing PTSD, Steve Andreas works with an Iraq Vet for 9 hours, using NLP methods to transform her complex PTSD symptoms. You'll see how to help someone resolve flashbacks, nightmares, rages, grief, perfectionism, anxiety, hypervigilance, and the internal critical voices that trigger many of these — as well as work with the impact of these problems on relationships at home and at work. Click here to learn more and to watch a sample video. For live trainings in the most innovative and effective methods in the field of NLP, click here. Steve Andreas, with his wife and partner Connirae, has been learning, teaching, and developing patterns in Neuro-Linguistic Programming (NLP) since 1977. Steve and Connirae are the co-editors and/or authors of many NLP books (both classics from the early days of the field, and new innovations) and over fifty NLP articles. They have also produced over fifty videotaped and audiotaped demonstrations of NLP patterns for personal change. Steve's new two-volume book, Six Blind Elephants; understanding ourselves and others, (2006) presents a comprehensive “unified field theory”of thinking and personal change. It shows how all personal change can be understood using three simple variables, and how to use these understandings to track someone's thinking and adjust it so that it is more satisfying. Steve has also written a new book entitled Transforming Negative Self Talk available through Norton or Amazon.com. There is also a second volume entitled Help with Negative Self Talk, vol 2 available in eBook form from Real People Press. The two books include many unique and powerful new patterns for quickly transforming troublesome internal voices. And finally, Steve has recently created some NLP client session videos. These videos highlight the kinds of rapid results possible with NLP techniques, with clients with little to no NLP background. Videos are available as DVD or download on the Real People Press website. Steve offers seminars and trainings himself, plus he enjoys bringing some of the most innovative and effective NLP Trainers to Colorado for in-depth learning programs. Check out Steve's NLP Blog to read articles on new NLP patterns and observations, NLP events, and products related to the field. For NLP books CDs, DVDs, & Downloads, visit Real People Press.